For additional information, visit the HUD Federal Registers page at hud.gov. National Mortgage Settlement Monitor, Joseph Smith, released the latest report last week on the progress made by the five major mortgage servicers – Bank of America, Citi, GMC/Ally, JP Morgan Chase, and Wells Fargo – that are part of the settlement. Like the previously released report, Mr. Smith notes in a statement that this new report is not required by the settlement, but is an attempt to be proactive in providing information to consumers about the progress of the settlement. The report covers the period of March 1st to September 30th. Nationally, $26B in relief has gone to over 309k borrowers. Just over $13B of the relief has been in the form of short sales, and $2.55B has been (first lien) principal reductions. As a result, the settlement continues to be scrutinized by advocacy and other groups looking for the groundswell of principal reductions expected as a result of the settlement. Locally, just over 13K borrowers have received $980M worth of relief, $485M of that in short sales versus $114M in principal reductions. Join the Capital Area Foreclosure Network (CAFN) and other stakeholders for a discussion of the scope of Northern Virginia’s foreclosure problem, existing housing counseling and outreach efforts, particularly in the area’s hotspots, and the resources needed to effectively combat the problem. Guest speakers include representatives from the Federal Reserve Bank of Richmond, U. S. Department of Housing and Urban Development (Office of Housing Counseling), Virginia Association of Housing Counselors, Virginia Cooperative Extension, Virginia Housing and Development Authority and VOICE, among others. The session will also include an open discussion on Northern Virginia’s counseling needs versus capacity. Enterprise Community Partners will host “Rebuilding Neighborhoods: Innovative Solutions for a Post-NSP World,” Tuesday, December 4, 2012, 2:00 PM to 3:30 PM. The city of Cleveland has been hit hard by the foreclosure crisis. In many neighborhoods home prices have fallen by more than half since 2005 and nearly 16,000 properties sit vacant and blighted. The availability of HUD Neighborhood Stabilization Program (NSP) funding provided a brief but welcome solution to some of these problems. However, with that resource fading, what is the way forward in a post-NSP world? Now, more than ever, creative vacant housing redevelopment strategies are needed to reverse decline and rebuild damaged markets. This webinar will highlight the approach of two local community development organizations, Slavic Village Development and the Detroit Shoreway Community Development Organization, who are experimenting with novel approaches to housing renovation that requires little or no subsidy. Joined by Frank Ford from Neighborhood Progress Inc, this discussion is sure to offer inspiration for organizations across the country as we retool to face similar challenges in our own neighborhoods. The Fairfax County Redevelopment and Housing Authority (FCRHA) is pleased to announce the availability of up to 90 Housing Choice Vouchers for Project-Based Rental Assistance (PBA) in support of new housing opportunities for homeless families or individuals on the FCRHA’s waiting list, with eight in support of victims of domestic violence. Project-based vouchers made available will serve homeless individuals or families with supportive services as outlined in the Housing Blueprint. 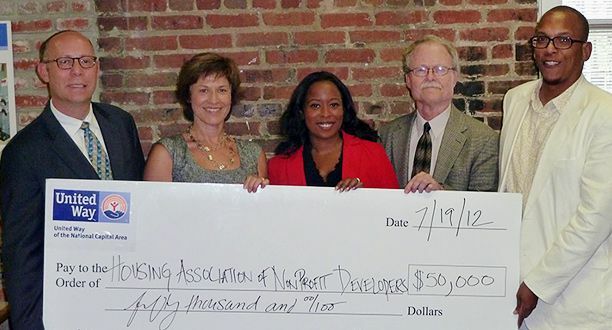 United Way of the National Capital Area (United Way NCA) awarded $50,000 in designated affordable housing funds through an Affordable Housing Initiative grant to the Housing Association of Nonprofit Developers (HAND). The grant enables the development of a Communications Action Network (CAN) that will advocate for affordable housing throughout United Way NCA’s eight regions. Over the next two decades, according to George Mason University’s Center for Regional Analysis, 731,457 new housing units will be needed to house the region’s growing workforce. Many of these new workers will have jobs that pay less than the area median income. In addition, in D.C. alone, more than 6,500 people are currently homeless, of which more than 1,600 are children. Some 39,000 households are on the waiting list for Housing Choice Vouchers and public housing. An additional 47,500 households spend 50 percent or more of their incomes on housing, leaving little for other basic needs. “The challenges of providing housing that people can afford impact each local jurisdiction and thus our entire region,” observed Heather M. Raspberry, executive director of HAND. The regional nonprofit organization is dedicated to building a professional community of housing providers in order to increase the supply of affordable housing in the Baltimore-Washington, D.C.-Richmond corridor. “It’s important that we communicate these realities effectively so we can help policymakers and housing providers better meet the need,” she added. Join us in sharing the positive benefits of housing affordability across the region. Did you miss the Annual Leckey Forum Held November 9? If you missed the Alliance for Housing Solution’s Annual Leckey Forum, held November 9, 2012, please use this link to review and download resources and information presented that day.